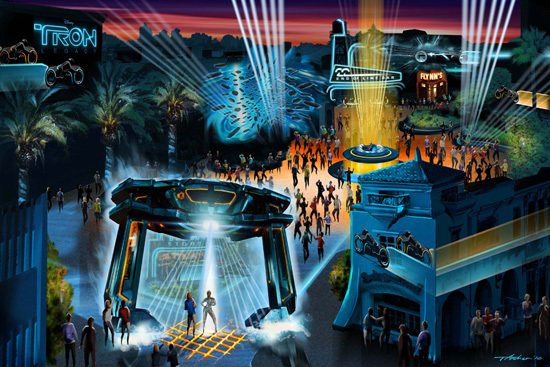 Welcome To THE GRID: Prepare to be digitized! 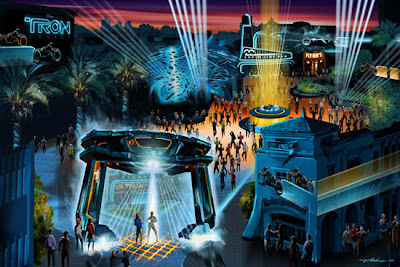 ElecTRONica, the newest night time experience at Disney's California Adventure brings to life the virtual world of TRON Legacy, the new Walt Disney Pictures' film opening nationwide on December 17, 2010. (My husband hasn't been this excited for a Disney movie since Pirates of The Carribean. Ha!) This high-energy street festival takes place in Hollywood Pictures Backlot. It took over for their big summer party GlowFest. (Which I adored.) ElecTRONica to me is a little more adult themed. But perfect for my older kids, ages 12, 14 and 15. It definitely brought out the inner-child in my husband too, he LOVED it! The magician's at Disney have recreated an authentic version of the original Flynn's Arcade. Which we were most excited about. They have old school games in it, straight out of 1982. Being that I grew up in the 80s, I felt really at home. Just some of the classic games included in the arcade are Pole Position (my personal fav) Pac-Man, Space Invaders, Centipede & Donkey Kong. You need a token to play, so you put your money in the machine, and get a keepsake token. (It's up to you if you want to use it or keep it.) 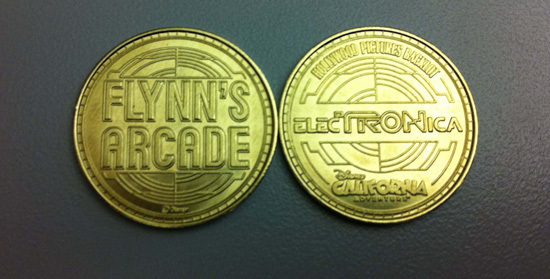 * I've also heard that sometimes when you go to get a fast pass for a ride at California Adventure, some people will get a coupon for a token for Flynn's. Super Cool! You get a chance to sneak-a-peak of the new movie: TRON Legacy which opens in theaters on December 17, 2010, we will be seeing this movie FOR SURE! It made me realize how much I miss the People Movers (remember those) They were one of my very favorite rides at Disneyland. Maybe they'll bring them back with the success of the movie. People dance and party the night away, while the live DJ spins a mix of techno, dance & electronica music. There are dancers and street performers using lasers, doing martial arts. I even had a girl pose for me, which I thought was really nice of her! Their costumes are amazing, but I wouldn't have expected anything different from Disney. The Poreotics (America's Best Dance Crew Season 5 Winner's) are also said to be performing at ElecTRONica from November 21 to the 24th. You remember one of my favorite parts about GLOWFEST was that they had alcoholic beverages. ElecTRONica is no different. You can get your incandescent concoctions at the END OF THE LINE BAR. Cheers to you LaserMan! Disclaimer: I was not paid for this post. I was given tickets in order to facilitate my review. my husband would loooove this! !